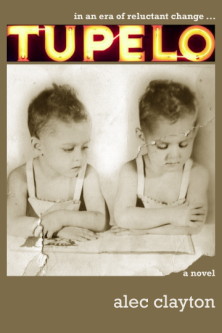 by Alec Clayton – A tale told from beyond the grave by Kevin Lumpkin, youngest of a set of identical twins, Tupelo is the story of a small town in an era of reluctant change. as seen through the eyes of a white boy born to privilege who comes of age in the time of Freedom Riders, lunch counter sit-ins, civil rights marches and demonstrations. Born in 1943 on the night when their father’s hardware store burns to the ground, Kevin grows up in idyllic times, the boom years of the 1950s—football, fast cars, rock and roll, and dates with the cutest girls in school. But gradually he discovers that he and his family live in a protected bubble while less than a block away in an area known as The Alley, a handful of black families live in poverty, almost invisible to Kevin and his family. He develops a crush on Maddie Jean, a young girl from The Alley, but they both know they can never be friends. He watches in confusion as his white friends react to the growing civil rights movement and in horror as they riot on campus at nearby Ole Miss when James Meredith breaks the color barrier. Order Tupelo from your favorite bookstore or Amazon.com.